well guess what, pkeller (if that is your REAL name): this is my blogospheric space. and i will do what i want with it. and because i'm such an awesome nice person, i'll share this quick and somewhat easy way of enjoying the delight that is yi-mein with chinese black mushrooms (more often called shiitake because people don't know any better). 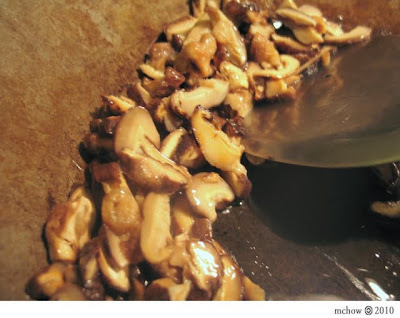 after you've boiled your noodles to soften them and left them to drain (they need to be dry), sauteed some garlic and sliced up mushrooms (here are some fa-gou, a type of chinese black mushroom) in some vegetable oil until fragrant.remove them from the heat and set them aside. don't eat them all or you'll have some sorry-looking noodles. back in the large frying pan/wok/contraption, heat up some oil at medium heat and then return the noodles to the pan to heat it up by turning it gently (use chopsticks if you can). mix up some basic saucea using about 1 Tbsp (15 ml) of quality oyster sauce with about 1/3 cup (~80 ml) of water. add a little bit of the sauce at a time to the noodles while they heat up; ensure the sauce is either soaked up or evaporated before adding more. this will keep the noodles dry, so they don't get mushy like the last time you watched bambi. continue until there's no sauce left and noodles are heated through and dry-ish. 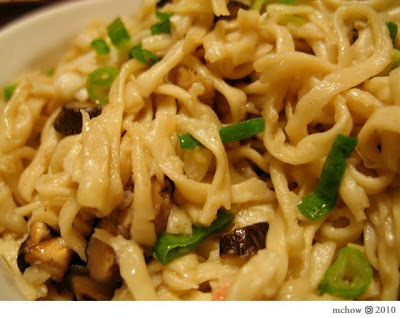 add the mushroom mix back to your noodles to heat them up and then finish it off with some sesame oil to taste. garnish with green onions and then eat it like there was no tomorrow. ait's not really a sauce, but let's pretend it is. can't wait till i have it again. droool. awesome, k! thanks for your feedback (and you're not the jerk...)!